In November 2012, Argos and the Bay Area Joint Policy Committee (JPC) agreed to do a pilot project to demonstrate how the TRACE™ system can be used for assessing regional climate risks. For those who aren’t familiar with the JPC, it is a coordinating body for the four Bay Area regional agencies: the Association of Bay Area Governments, the Bay Area Air Quality Management District, the Bay Conservation and Development Commission and the Metropolitan Transportation Commission. Of the variety of climate driven threats confronting the Bay Area, two were chosen for the pilot, droughts and heat waves. As discussed on our website, the TRACE system derives estimates of the probability distributions for climatic variables from ensembles of climate simulations generated by climate models. Technically, these should be viewed as Bayesian probabilities based on the evidence currently available, in this case climate simulation ensembles. The most recent and most comprehensive such ensemble is CMIP5, which is comprised of outputs from the model runs done by a broad cross-section of modeling group around the world in preparation for the Fifth Assessment of the IPCC. Although the first report from that assessment was released in September 2013, the model runs were completed in mid-2012 and have been available since that time. The CMIP5 runs are grouped into two major categories referred as RCP runs and decadal runs, where RCP is an acronym for Representative Concentration Pathway. In the Fifth Assessment, RCPs replace the SRES scenarios that were used in the Fourth Assessment to depict different possible future emissions scenarios. Each is labeled based on the degree of climate forcing it represents. The two mandatory RCPs that every modeling group had to run are RCP8.5, representing a business as usual scenario, and RCP4.5, representing a scenario with moderately aggressive mitigation measures. The RCP runs were initialized in 1850 and run forward in time from there through 2100 or beyond. The decadal runs, on the other hand, were all initialized in 2005 and run from 2006 through 2035. They make no assumptions about future emissions because the evolution of the climate through 2040 is almost entirely determined by past emissions. Because the Bay Are pilot focused on near to mid-term risks, the decadal runs were used for the analysis. As illustrated in Fig. 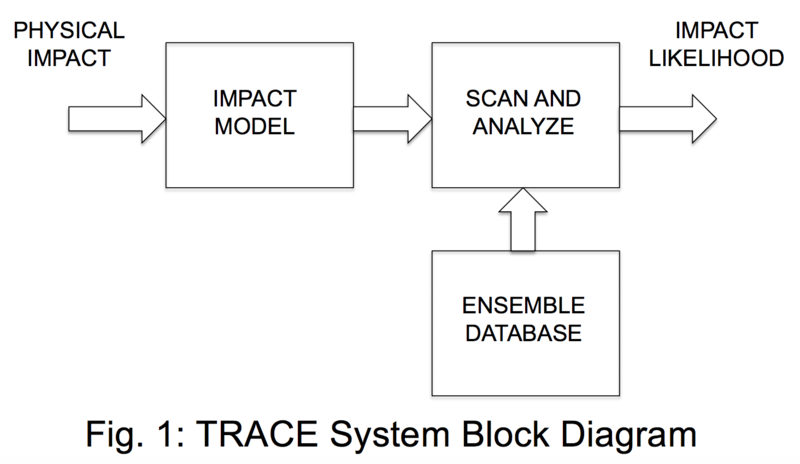 1, the TRACE system uses impact models to translate the climate impacts of interest into signatures expressed in terms of the climatic variables used in climate models. It then scans its database of climate simulations looking for instances of those impacts in the location, and during the time period(s), of interest for the particular analysis being done. As mentioned above, the impacts being investigated in the Bay Area pilot were droughts and heat waves affecting the Bay Area between now and 2035 and the first step was to develop the appropriate impact models for each. From a pragmatic perspective, a drought occurs when the agencies supplying water to consumers, businesses and farms have to limit water consumption to less than actual demand. This happens when precipitation is below average for long enough to deplete the storage throughout the water supply system. This means that it is necessary to look at precipitation where it is collected by the water system, not where it is consumed. In the case of the Bay Area, much of its water supply comes from the Sacramento River Delta, which in turn is fed largely by runoff in the Sacramento and San Joaquin River watersheds. In constructing an impact model, it is often helpful to start with a reference event. In the case of Bay Area droughts, we chose to use the 2007-9 California drought since it was severe enough that Governor Schwarzenegger declared a state emergency. Historical data show that during the three years of the drought, cumulative annual precipitation was 72% of an average year’s precipitation less than normal in those two watersheds. Accordingly, we defined the signature for future droughts as a cumulative precipitation deficit over consecutive years of 70% or more of an average year’s precipitation. We tested the model on historical precipitation data for the two watersheds from 1896 through 2005 and found it identified all of the significant droughts recorded during that period. It should be noted that there are a number of factors that this model does not take into account. It implicitly assumes that demand for water and the amount of storage in the water system remain constant. Nor does it factor in changes in the timing or phase (rain vs. snow) of precipitation or increased evaporative losses due to higher temperatures. While it is certainly possible to construct more sophisticated models that incorporate all of these, we concluded that the simpler one provided a reasonable first approximation for the period of time we were looking at. Fig. 2 shows the estimated probability per decade, based on the TRACE analysis, that droughts of various lengths will occur over the next two decades, compared to their actual frequency in the past. There are two points that stand out. The first is that the overall likelihood of a drought, independent of its length, is now 80% per decade. There were 6 droughts that satisfied our drought signature in the 110 year historical record referred to above, 3 each in the first and second 55 years, equivalent to a frequency of 55% per decade. The second point is that there is now a meaningful chance of a drought significantly longer than any that occurred during that period. We also defined a drought severity index as the average annual percentage precipitation deficit for the remainder of the drought after the 70% cumulative deficit had been reached. This can be thought of as representing the shortfall that water users will have to deal with once the storage in the water supply system has been depleted. 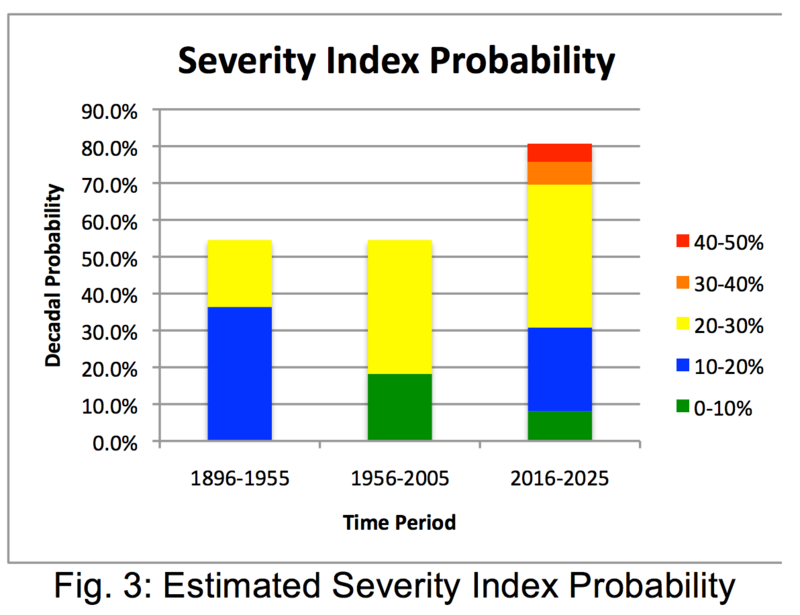 The current probability of droughts of various levels of severity is shown in Fig. 3, again compared to historical experience. 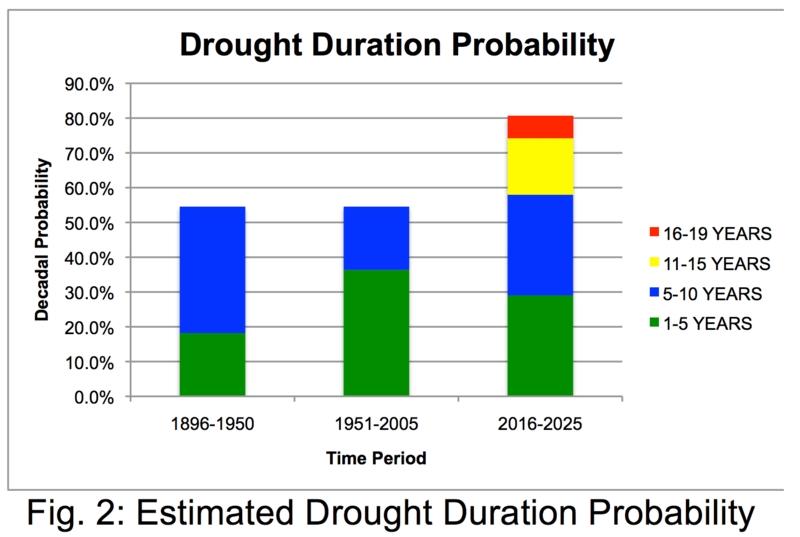 The key point in this case is that severe droughts are more likely now than they were between 1896 and 2005. Examining both Figs. 2 and 3, it seems clear that the Bay Area got off relatively lightly between 1956 and 2005, compared both to the earlier historical period and to what the future situation is likely to be. The obvious implication for water system managers is that they should be thinking seriously about how to increase the amount of storage capacity in their systems, reduce demand, or both. As a reference event for heat waves, we used the one that occurred in July 2006, since it set a new record for the number of consecutive days with highs over 110o F somewhere in the greater Bay Area. In fact, that particular heat wave was also notable for the large multi-state area it affected, its relatively high level of humidity and the number of heat related deaths it caused. After examining historical records for that period at several locations that experienced the highest temperatures, we selected the data from the Livermore airport as a basis for constructing the signature. Because the health impacts of heat waves are greatest when nighttime temperatures remain high, the signature we chose to use for the analysis was 3 or more consecutive days with highs > 110o F with intervening nighttime lows > 75o F. Before comparing the temperature data stored in the ensemble database to the signature we added 1.4o F as a bias correction, reflecting the fact that the spatial resolution of the CMIP5 global climate models is considerably larger than the Bay Area. Fig. 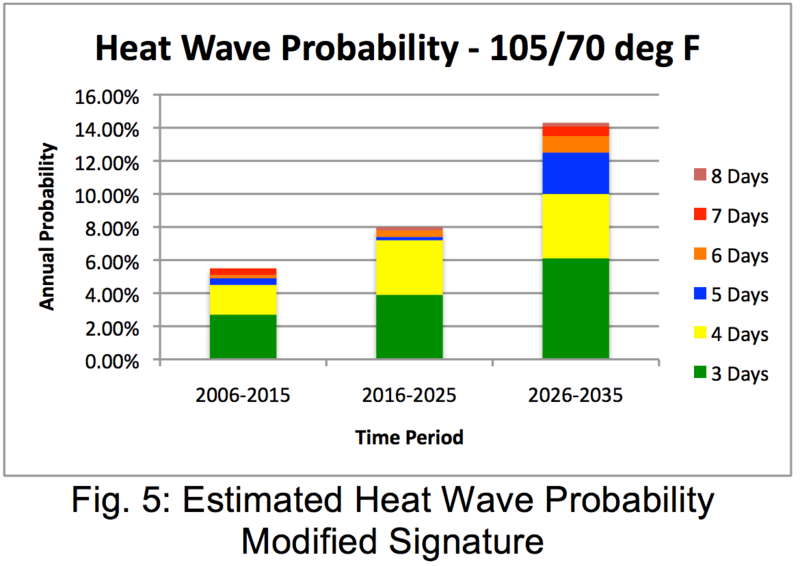 4 shows the estimated annual probability of heat waves satisfying this signature, based on the TRACE analysis. Historically, events of this severity have been extremely rare and, in fact, we found no instances in the ensemble between 2006 and 2015, underscoring that fact. The likelihood does increase with time but even by 2026 to 2035 they are only 40 year events. It turns out, interestingly enough, that this is not due to any shortage of consecutive days with high daytime temperatures, rather it is due to the very low frequency of high nighttime lows. We then decided to see how sensitive the results were to the specific signature that we had used and did a second analysis with 3 or more consecutive days with highs > 105o F with intervening nighttime lows > 70o F, whose results are shown in Fig. 5. The contrast is startling! 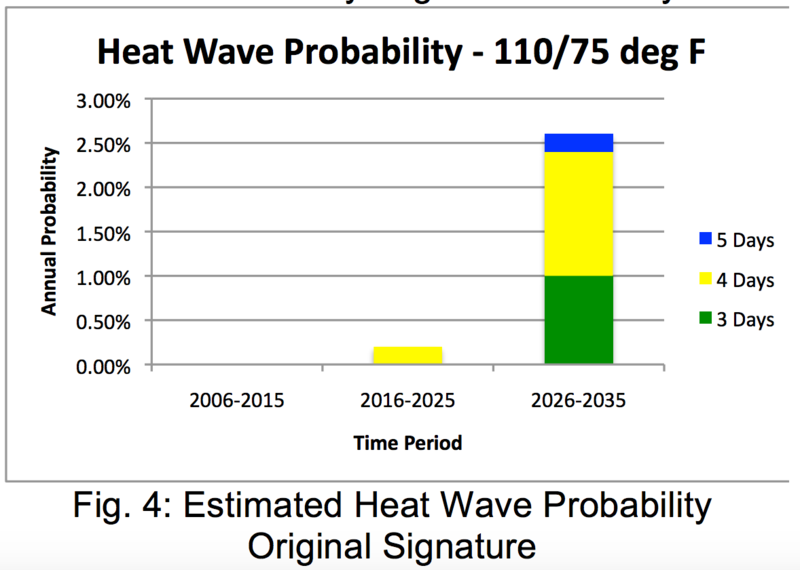 With this signature, heat waves go from 20 years events in 2006 to 2015 to 7 year events in 2026 to 2035. In addition, the likelihood of relatively long events also increases significantly. While these events are not as severe as those with the original signature, they can certainly produce substantial discomfort, or worse. In addition to providing useful information for those trying to determine which of the potential impacts of climate change on the Bay Area are the most serious and the most imminent, the pilot also demonstrated the versatility of the TRACE system. In the course of the pilot, we looked at different climatic conditions in different locations at different points in time. We also looked for impacts due to both multi-day events and multiyear events. Finally, we showed how easy it is to do sensitivity analysis by varying the parameters in an impact signature. The bottom line is that for those who need a big picture view of what climate change means to them, the TRACE system is a tool that is well suited to the task and, because it takes advantage of the extensive computing already done to generate climate simulations, one that can produce useful information quickly and inexpensively.